In the blender bowl, add the cake mix, water, oil and eggs, and mix according to the directions on the packet. Lastly, add the cranberries and walnuts and fold in carefully into the cake batter so as not to damage the dough. I like the mold for roscas, but you can use any mold you like. Cover your mold well with the cooking spray and pour the cake mixture into it. Make sure that the dough is spread evenly so the cake cooks uniformly. Bake at 350 °F, as per the instructions on the package and depending on the mold you decide to use. To see if the cake is ready, insert a toothpick in the center. If it comes out clean, it’s done. While it’s cooling, prepare the frosting. Place the cream cheese at room temperature in the blender bowl. Whisk until you get a creamy consistency. Add the powdered sugar and cranberry juice, and beat until the frosting has a slight pink color. When the cake is cool, unmold and place on a tray. 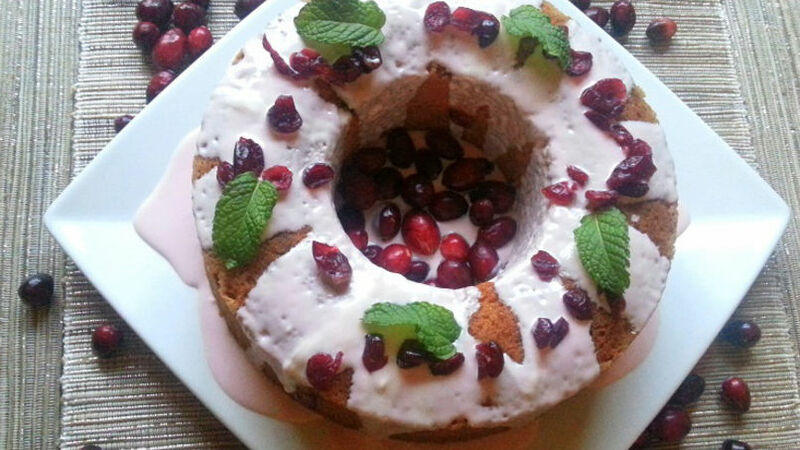 Spread the frosting on the cake and decorate with fresh cranberries, dried cranberries and mint leaves. If you don’t like cranberries you can use raisins, and substitute the cranberry juice with 1 tablespoon of vanilla, 1 tablespoon of rum and 1/2 a cup of powdered cinnamon. It wouldn’t be Christmas without delicious desserts! With that in mind, I started looking for ideas for simple cake recipes to include on my holiday table. Everyone knows I'm not an expert baker, but there are many products on the market to make our life easier. Today I want to share my recipe for cranberry cake with walnuts that is very easy and quick to make. Let’s get baking for Christmas!